Saturday, Sept 22, 2018 at 7:30 p.m. Please help us spread the word about this show by clicking here. The Brain Injury Association of Michigan. The Epilepsy Foundation of Michigan. May 22, 1997 - One of mom and dad's favorite photos of Amy. The chalk says "I (heart) my bike / I try hard / I don't quit / I know I can DO IT / who am I? AMY"
Lisa graduated from Adrian College in December of 2015 and is now living in Lansing, Michigan with her new dog Ginny. Lisa - accepted into ITP program (06/2017). 2015 - Lisa is a senior! She underwent a temporal lobe resection (brain surgery) in the summer of 2010 and her seizures are now under control. She's majoring in English with a minor in Journalism. She's planning to pursue a certification in ASL (American Sign Language). Information about the 2013 Amy Fedel Memorial Concert is here. Copies of the press release, and some other items are here. 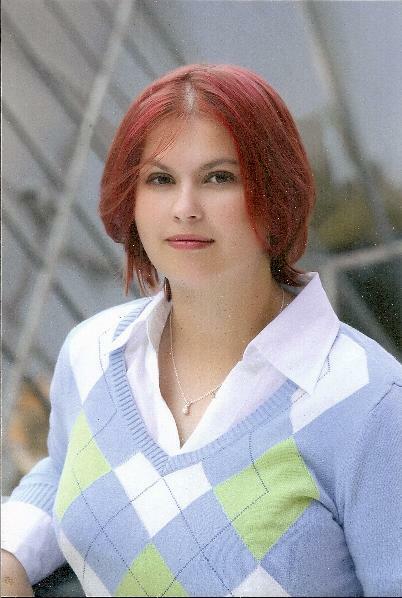 Information about the 2010 Amy Fedel Memorial Concert is here. The 10th Anniversary Amy Memorial concert was a rousing success! Thanks to everyone who attended, you made it an incredible evening for the band and the kids. We raised $950 for our two charities: MADD and the Epilepsy Foundation of Michigan. If you enjoyed the Bonfire Poets and five miles more, please check in periodically to see their upcoming performances. Copies of the program, the press release, and some other items are here. 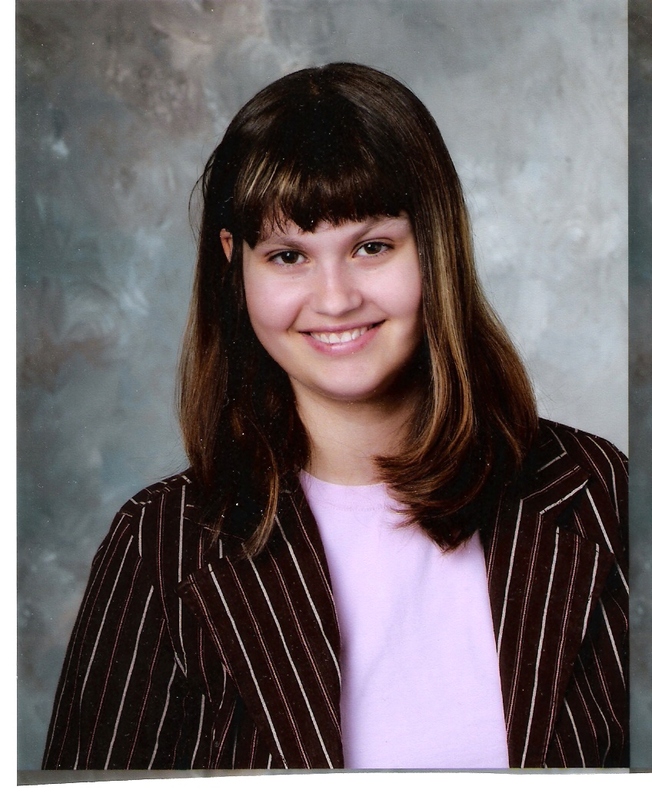 Information about the 2006 Amy Fedel Memorial Concert is here. Information about the 2005 Amy Fedel Memorial Concert is here. Information about the 2004 Amy Fedel Memorial Concert is here. 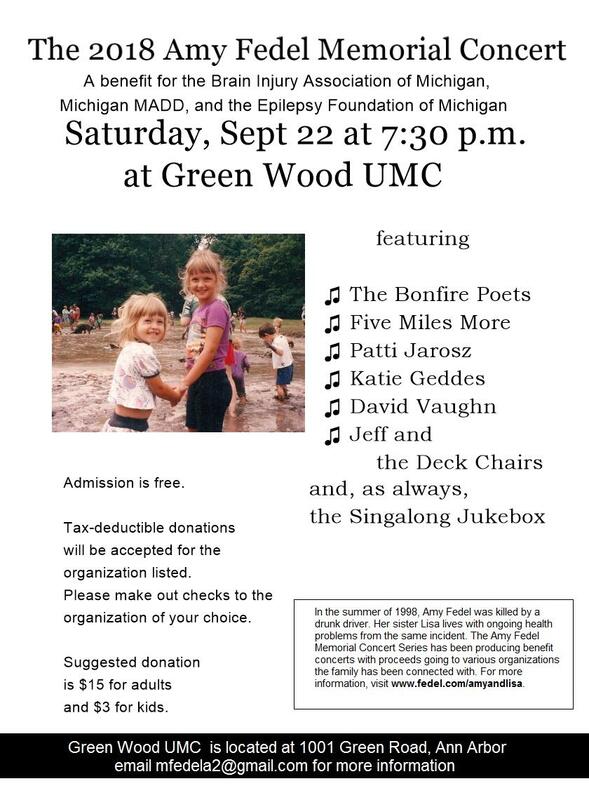 Information about the 2003(fall) Amy Fedel Memorial Concert. Announcement for the 2003 Spring spring fundraiser to our schedule. Announcement for the 2002 Amy Fedel Memorial Concert with Peter Alsop! Hallowed Ground photo exhibit will host an opening reception at the Pierpont Commons on U of M campus on Monday, October 14,2002 at 7 p.m.. Please attend and meet the artist Bill Sampson. Announcement for the 2001 Amy Fedel Memorial Concert with the Hali Hammer Band and Katie Geddes and the Usual Suspects. The Amy Fedel Memorial Reading Program -- developed in conjunction with the Ann Arbor District Library -- is offering its first session on January 22, 2000. The Amy and Lisa Fund is developing an award to be given for writing in the "No Comment" magazine. We will be looking for writing that reflects strong creativity and/or strong leadership and decision making ideas. Flyer for the CD Release Party on December 11, 1999. The Amy and Lisa Fund is discussing other events and programs we would like to sponsor or partner with. Information has been posted about these events. If you have ideas, would like to co-sponsor something, or are just curious, please review the proposals and send us some email. The 1999 Tour de Kids was dedicated to Amy's memory. Amy's favorite poet, Shel Silverstein died at age 66. Article in the Ann Arbor News Online about sentencing in Amy's case. 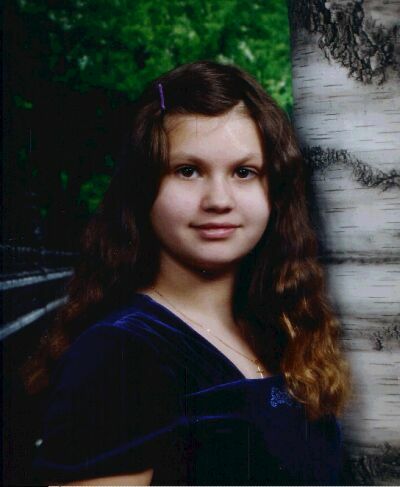 Amy Fedel was killed by a drunk driver on August 1, 1998, four days after her eighth birthday. 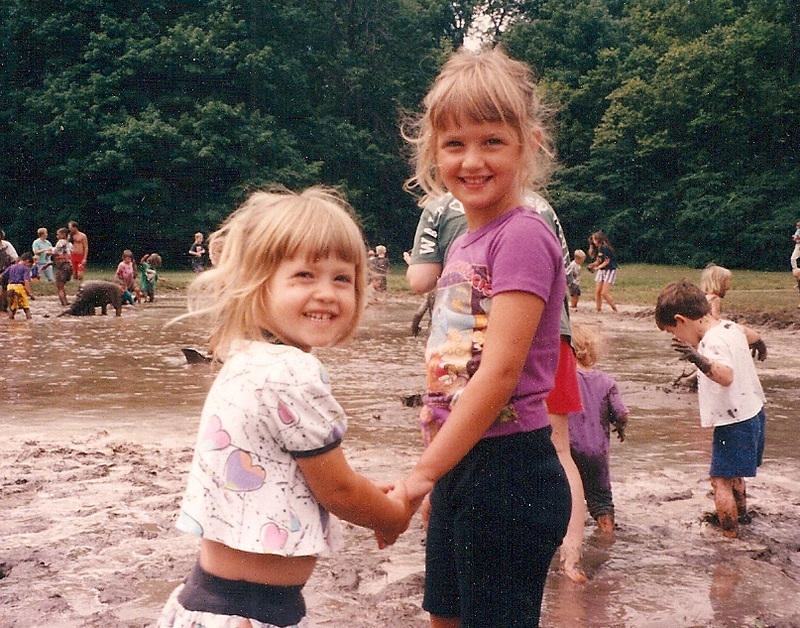 Her little sister Lisa (5) was seriously injured and was in a coma for several weeks. At around 6 p.m. on Friday night, July 31, our family headed to northern Michigan for a weekend. Dad was planning to play the guitar with a church band at a service in Alpena on Sunday. We'd decided to go a day early so the girls would get to see the Mackinaw Bridge and play on the shores nearby. We stopped for dinner at a Big Boy restaurant. Amy and Lisa were excited to see a hot air balloon that dipped down to fifty feet or so across the street. We talked about maybe taking a hot air balloon ride next summer. Amy was her usual self during dinner: enthusiastic, funny, curious, playing with her sister. She had crab for dinner and ordered the hot fudge cake for dessert. She let it melt down a bit, then stirred together the fudge, the cake, and the melted ice cream. She said she was making a "soup" and invited the rest of the family to taste it. We got back into the Aerostar and started north again on I-75. At about the same time, there was a drunk driver coming north on the same road. The drive was uneventful. Amy spent most of the time in the back seat playing with Lisa and a new doll they'd got earlier. She was reading in the back seat using her flashlight for quite a while after dark. She finally proudly announced "I'm done now! ", closed the book, put her head back against the seat, and fell asleep. Dad noticed a string of tail lights in the road ahead. In front of them was a double row of yellow lights. A semi truck had turned over on its side and traffic was stopped. There were a handful of cars already stopped. We slowed down, eventually stopped at the end of the line. From his report, he had his cruise control set at 70 M.P.H. By the time he noticed that the cars were not moving, it was too late to brake. There were no skid marks, he hit the back of our van at his full running speed. We would later learn that our beloved Amy was killed instantly. Lisa's injuries were also classified as severe but she survived. She was in a coma for several weeks and in hospital for several more. Lisa's treatment while in Petoskey was handled by a wonderful doctor named Dr. David Morris at Northern Michigan Hospital. She was transferred to Mott Children's Hospital in Ann Arbor on August 20, then released for outpatient rehabilitation services on September 18. Mom and Dad were also taken to hospital. Jean suffered a tibial head fracture (a nasty type of broken leg) and three broken ribs. Mike had a broken scapula and cuts on the forehead. The driver pleaded guilty to 2 counts of OUIL, one causing death and one causing injury. (These were the charges for Amy and Lisa.) Similar charges for Mike and Jean were dropped in exchange for the plea. The driver was sentenced on February 2, 1999 to serve 4-to-15 years for OUIL causing Death (Amy) and 3-to-5 years for OUIL causing Injury (Lisa). In Michigan, these sentence are served concurrently. The actual time served will probably be less than 3 years. MADD is the well-known national organization which does constant work to make people aware of the impact of drunk driving, to encourage legislative change. This is an organization for people who have lost childen. They are there to help people who are caught in this nightmare make it through the next day, the next week, the next year. Lisa's injuries from the car crash have left her epilepsy to control for the rest of her life. The folks at this organization have been very helpful both in terms of education and advocacy. This group is also very helpful in terms of advocacy and education for people with closed head injuries. SAMHSA is the Substance Abuse and Mental Health Services Administration webiste. This is the government-sponsored search engine of more than 20,000 drug and alcohol treatment providers, offering different methods and levels of care across the country. This is the most comprehensive overview of current research and statistics on drunk driving and DUIs that we could find on the web. The page includes more than 20 citations over governmental and academic authorities on the issue, as well as a discussion of prevention and treatment. This is an excellent overview of the many types of legal consequences one must face for a DUI, aside from the obvious of jail, suspension and fines. Another good means of deterrence.